The Google Pixel 2 and Google Pixel 2 XL launch date is October 4, but these two phones will have wildly different release dates, according to a new report. While the Pixel 2 will ship to customers on Thursday, October 19, the Pixel 2 XL won't reach its first buyers until Wednesday, November 15, reports VentureBeat, citing a person familiar with Google’s release plans. It's almost a sign of the times. The bigger phone – always the more high-end and more expensive phone you really want – has an unfortunate wait time attached to it. Apple users are experiencing this right now. There's a month-and-a-half lag time between the iPhone 8 and iPhone 8 Plus and the iPhone X. Samsung and LG routinely launch smaller flagships in the first half of the year, and higher-end phablets later in the year. Is Google Pixel 2 XL worth the wait? The differences between the Google Pixel 2 and Google Pixel 2 XL appear to be cosmetic, according to months the rumors that hint at similar internal specs. Both Android Oreo phones are said to have a 12MP camera, at least 4GB of RAM and 64GB or 128GB of storage choices. Unlike last year, both phones have front-firing stereo speakers and be waterproof, according to several leaks. What's different? The screen may again be a higher resolution on a larger Pixel, as it was a year ago, giving us another Full HD vs Quad HD match-up. That's a big deal if you're planning to use the Google Daydream View VR headset. The rumored 6-inch Pixel 2 XL display is also going to be taller, just like popular nearly bezel-less screens today (Note 8, LG V30, iPhone X). This makes way for the 18:9 aspect ratio, something the Google Pixel 2 didn't have last year. 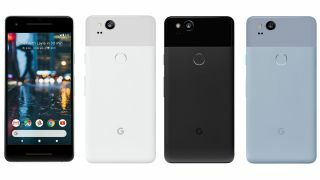 Expect the Pixel 2 XL to have slightly better battery life and come in 'Just Black' and 'Black & White' color variants. Pixel 2 leaks point to a smaller battery, but an extra hue: 'Kinda Blue' will join 'Just Black' and 'Clearly White' colors. We are also anticipating major differences in how much these phones cost. We'll know the official Google Pixel 2 price and release date soon, as we're attending Wednesday's big launch event.